I realise I’m doing this back to front, writing about my last few days before I even managed to post about the start of the trip, but I seem to have some time on my hands due to an unexpected turn of events on our return home (more of that to come). Our journey since leaving Ndhiwa has turned into an adventure all of its own….. It all started Tuesday morning at 7am when we (Kat, Dani and I) were collected from the peaceful surroundings of Karibuni Eco Cottages for our journey to the Masai Mara. 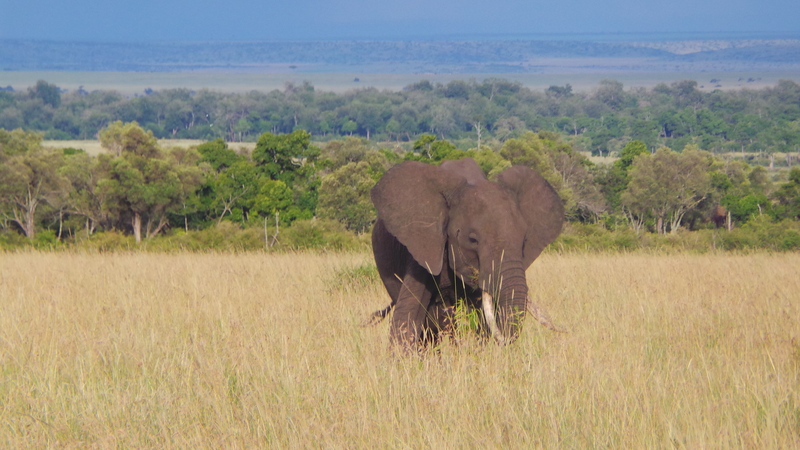 We had treated ourselves to a two night safari before leaving Kenya; well, it would be rude not to wouldn’t it? As we headed off, our driver, Charles, informed us that it would take about 7hrs ‘the long way round’ or we could take ‘the short cut’ and travel in convoy with two other groups. He informed us he wouldn’t normally go that way during the rains unless there were other vehicles in the group as the roads can be bad. At this point we should have read the warning signs. Instead we looked at each other, grinned, and cheerfully informed Charles that we were always up for an adventure and ‘the short cut’ sounded just fine. Ten minutes later I was wishing I’d worn the sports bra I’d been recommended to bring for safari; we had already hit the roads which would be our driving surface for the next 3 days and to say it was a little bit bumpy would be something of an understatement. We travelled for a couple of hours and had a short stop, during which we were advised by Charles to stock up on snacks in the supermarket (we were to be glad of this as the day wore on). By this time the rest of the convoy had joined us, so off we set again. About 30 minutes after that we hit Challenge #1. 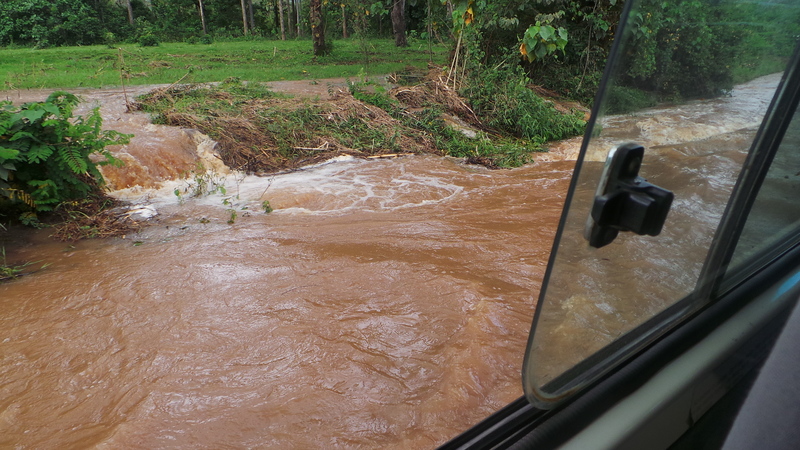 Due to heavy rains, the river ahead was a torrent of water which had flooded over the bridge we needed to cross. The water coming off the down-river edge of the bridge was essentially a very full waterfall. The three drivers got our for a closer look to assess the situation, deciding eventually it was a no-go and that we would have to turn back to cross in another place, which would result in us being 30 mins from our starting point over 5 hours after leaving! (We were tempted to suggest building a raft to ferry the vans across á la Clarkson & Co, but it was really too hot to be bothered.) Some friendly locals suggested an alternate route which Charles and his colleagues had never used before. It was decided that this would save such a massive detour so off we went into the unknown. Challenge #2 turned out to be similar to the first, though slightly less extreme. Charles bravely decided it was crossable, we held or breath, braced ourselves and off we went. We made it! Surely nothing could stop us now, could it? 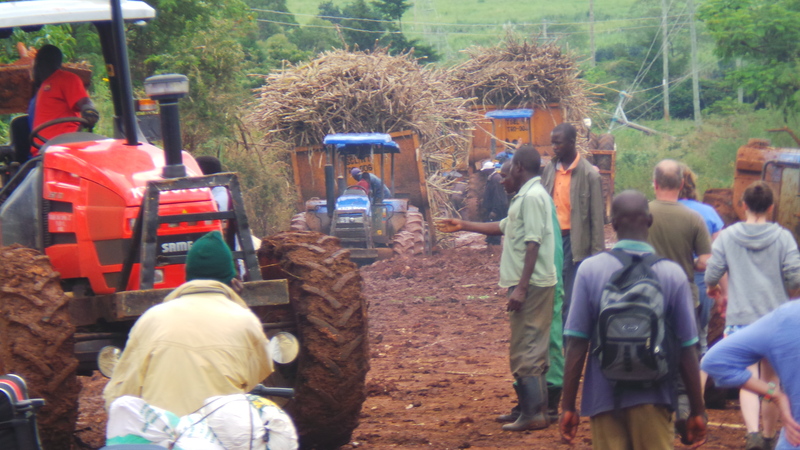 Our route took us through miles of sugar cane plantation and our route was shared with many tractors towing the harvested canes to a sugar refinery. No doubt they were responsible for much of the damage to the dirt roads, but without them we would not have got out of Challenge #3. The road ahead became blocked, tractors stuck as the mud was too deep even for their huge wheels. Motorbikes and other tractors were starting to bypass the road, going through the field on the other side of the hedge, but our vehicles would not be able to get through alone. Whilst the drivers sussed their options, Kat, Dani and I took the opportunity to people watch. We were especially impressed with the family of four, plus suitcase, which rode calmly passed us into the mire. Given the state of the roads thus far, we were amazed that there was barely a muddy mark on any of them (we, on the other hand, have had filthy feet feet for a week, unable to get rid of the ingrained mud from the paths we have been walking!). We were not so impressed however by the fallen over electricity pylon, resulting in live power lines barely a couple of metres from the road side! After much discussion, it was decided that we would be towed by a tractor. More bracing and holding off breath and we were through, though there was a good deal of cursing going on in the back when it seemed certain we would topple over! The remaining two vehicles got through and off we went again. For less than a minute. Challenge #4 came approximately 15 metres later, courtesy of the tracks in the road being too deep so we just became grounded. I think Charles was a little embarrassed by his faux pas but once again a tractor came to our rescue and dragged us out. The other two vans got straight through. It was to be some time before the next challenge came along. 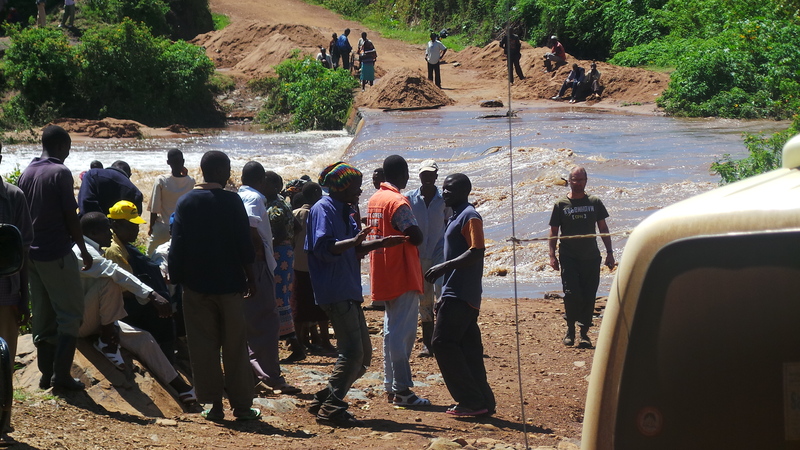 In the meantime Charles very capably navigated us through, over and round some awful potholes (though the term barely fits justice to the size of them), damaged bridges, rivers and ravines in the road. 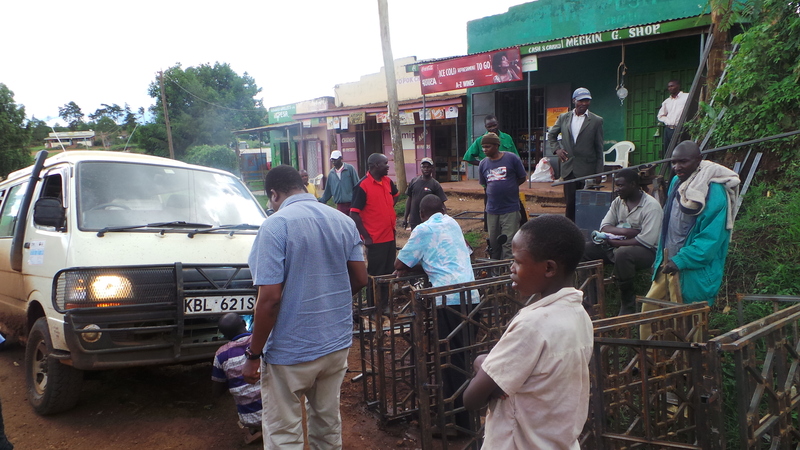 There was a short stop in a village whilst one of the vans had the front grill re-welded into place. We were happy when we weren’t the lead car; at least then we could see what was ahead and prepare ourselves. Eventually we came to a junction in the road which Charles announced was where we would have come out had we been able to cross the original river. That stretch would normally take half an hour. It had taken us four and a half hours to get to that point from where we had turned round, a four hour detour. By this time we were starting to get weary and desperate to get to our destination. We were picturing a refreshing dip in the pool (a chance to soak the feet!) and cocktails. However we had not yet reached the gate into the Masai and knew there was a three hour journey still from that point, so we resigned ourselves to the fact that it would be dark when arrived and the pool would have to wait. As we got closer to the park we entered some woodland. Charles announced that from this point on we wound start to see wild animals. 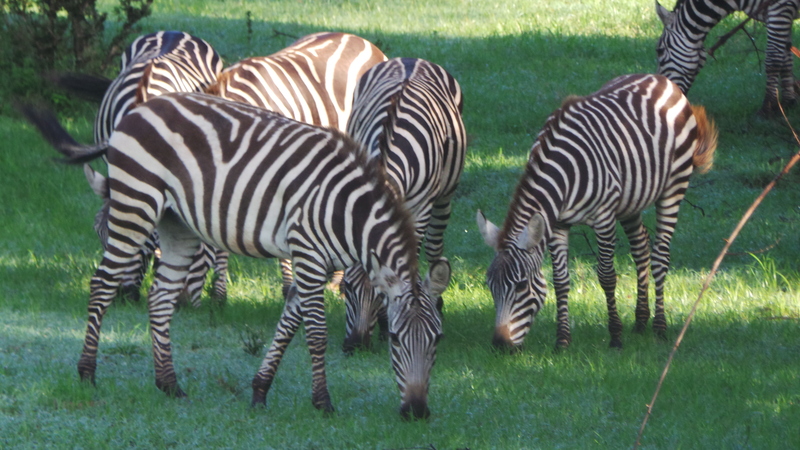 Spirits were lifted when, true to his word, not two minutes later we saw a small herd of zebra in a clearing. From then on we saw lots of them and started getting more excited about what was ahead. The road was climbing higher and higher and we started to see Masai people, clearly visible in their red checked cloaks, tending to their sheep. We passed through a small settlement at which point Kat, the geography teacher who teaches about the Masai people, got very excited! As we came out of the village Charles pointed right and all of a sudden it was there: below us, as far into the distance as we could see lay the plains of the Masai Mara. The journey back down hill was painfully slow. The road was little more than a rocky path, most suited to donkeys. We had much admiration for suspension of our 4×4 van, which had been and truly tested. 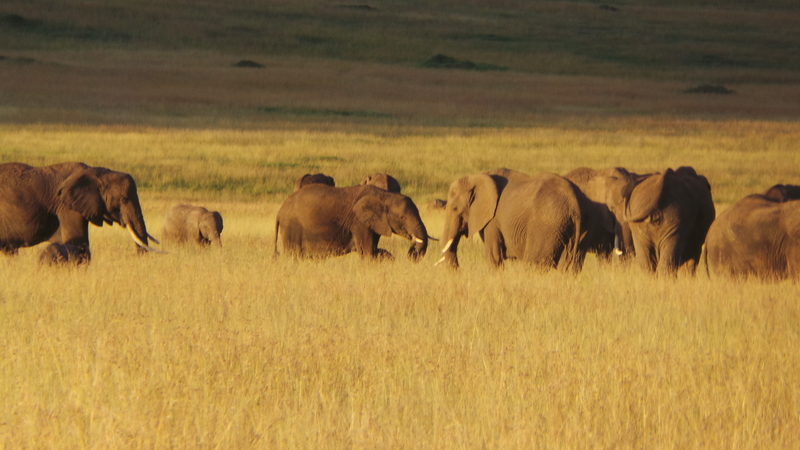 And then we were there, at the East Gate to the Masai Mara Conservancy. After a quick comfort break (actual toilets!) 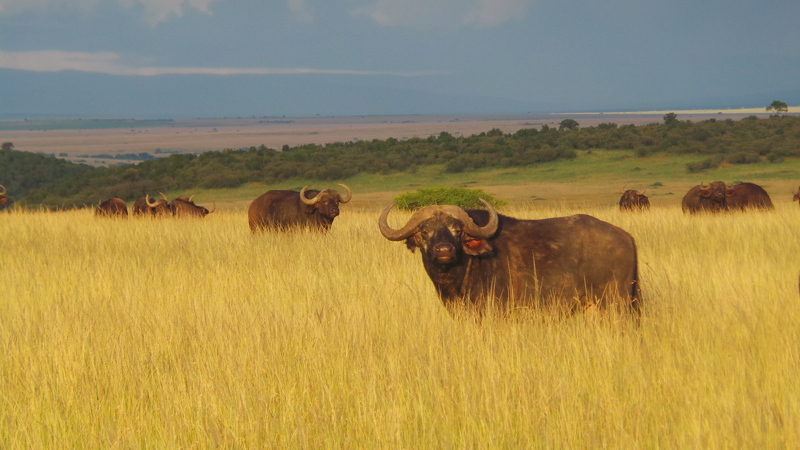 We got back into the van which now had a raised roof – we were officially on safari! We were all feeling a little emotional and the odd tear was shed behind the security of our sunglasses. We knew just how privileged we were to be there. Myself in particular. 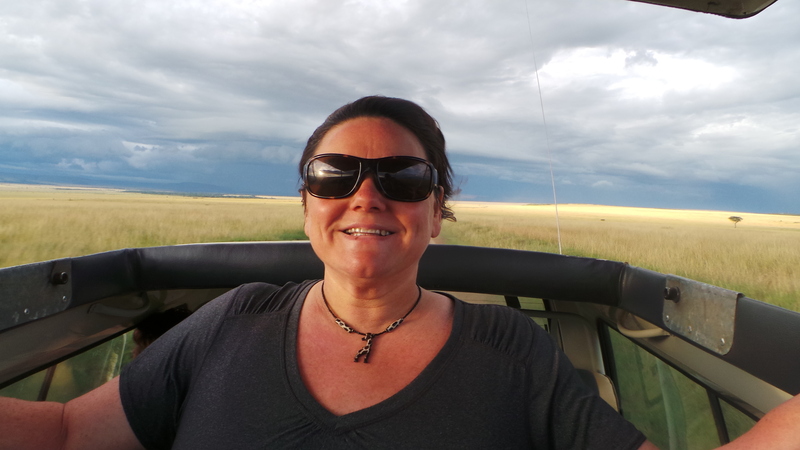 I consider myself to be a very lucky lady to have fulfilled two lifetime ambitions in this past year: seeing the Terracotta Army in China and now a game drive in the Masai Mara. I had shared the first with my husband and there was more than a twinge of regret that he wasn’t there with me to see this. Oh well, all the more excuse to come back. It was amazing to stand up and stretch our legs after the journey we had endured, but even better to look out over the staggering scenery. It was late afternoon by now and the light from the setting sun was stunning. It wasn’t long before we spotted a couple of giraffe nibbling at a tree. We were desperate to take photos but Charles assured us that we would see them much closer. Our next spot was a small group of elephant, close to a small track if the main route, so we got in really close to watch them. As our journey progressed we saw a hyena cruising in front of us, then another asleep on the side of the track; we saw more elephant – in much larger herds – giraffe, guinea fowl, some amazing birds, more zebra and loads of Impala. But no big cats. Still, a pretty good haul so far. Charles had mentioned that rhino spottings would be highly unlikely and even hippo, due to the river levels being so high. However at the first watering hole we passed what should we spot other than the hippo we thought would be so elusive. 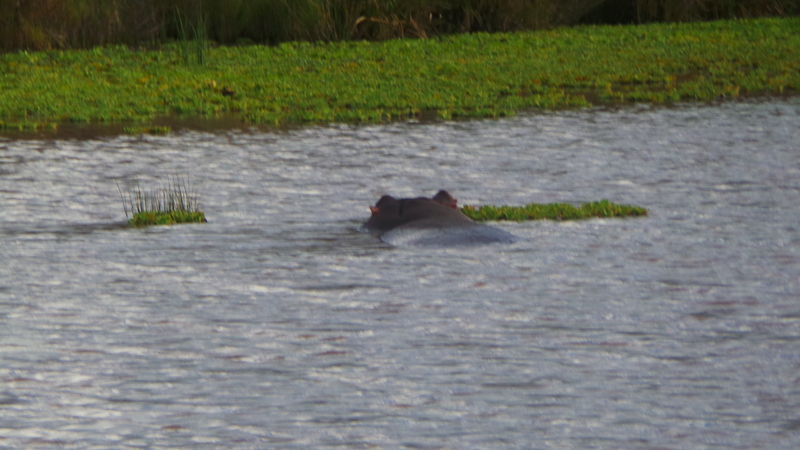 OK, so only the top of the head was visible but it was a hippo nonetheless! By now light was stating to fade and in the distance we could see the rains starting, so we pulled the roof down and got settled for the last hour or so in the dark. The rain however came very hard and son the track became very hard going. We were sliding around a lot and even slight inclines were starting to pose a problem. Eventually we and van in front stopped: the third vehicle had become stuck a while behind and are waiting for the ranger to pull them out. We were tied and more than a little tetchy b it it was clear that Charles wasn’t going anywhere till all three vans were together. By now it was 8.30pm and we had been on the road for over 11 hours. Charles called the hotel to arrange that e could east a late dinner when we arrived, estimated at 9.30pm. Soon we were all on the way again. And then we weren’t. We were lead vehicle when Challenge #5 struck. The van just wasn’t getting up the next hill, but neither could we get back down for another run; we were well and truly stuck. Out came the trusty tow rope once again, this time to pull us down the hill as the other vehicles were behind and couldn’t get past. As Charles and friends were attaching the rope, along came a ranger’s Jeep. Out came a ranger who watched over proceedings, rifle in hand. The perils of getting stuck in a game reserve I guess.The rain however came very heavily and soon the track became very hard going. We were sliding around a lot and even slight inclines were starting to pose a problem. Eventually we and van in front stopped: the third vehicle had become stuck a while behind and were waiting for the ranger to pull them out. We were tired and more than a little tetchy, and just wanted to get going, but it it was clear that Charles wasn’t going anywhere till all three vans were together. By now it was 8.30pm and we had been on the road for over 11 hours. Charles called the hotel to arrange that we could eat a late dinner when we arrived, estimated at 9.30pm. There was to be no Challenge #6 that night (though we wouldn’t have to wait long the next morning!) and we eventually arrived at the hotel shortly after 10pm. Our ‘short cut’ had taken over 14 hours, twice what the ‘long way round’ was expected to take. The next time someone offers you the chance for an extra adventure, especially during rainy season in Africa, think carefully before you accept.